The Opinion focuses on the macroeconomic forecasts underlying the proposal for a Stability Programme 2019-2023 (SP/2019). 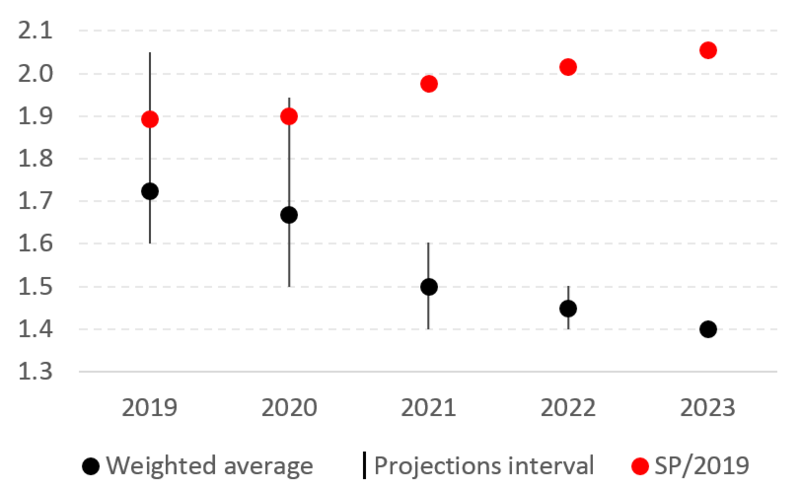 Considering its analysis, CFP endorses the forecasts for 2019-2020. Based on the most recent information available for the national and international economic Outlook, the forecasts for this period are within the limit of likelihood of the forecasts, even though they contemplate increased downward risks to economic growth, mainly from external factors. However, CFP does not endorse the forecasts for 2021-2023, given the significant divergence from the other forecasts and projections considered, both in terms of product growth and its acceleration path. According to CFP, based on available information, such forecasts do not translate the most likely scenario neither a more prudent scenario. Source: SP/2019; CFP calculations – the weighted average of the growth rates published by the other institutions (OECD, EC, CFP, IMF and BoP) is calculated by weighting the respective indicator of each institution according to the degree of information available at the time the projection was made. For more information, see notes on Graph 4 of the Opinion.